The smartly designed Accademia is a latte and cappuccino drinker's dream, as it features a unique Milk Management System with a detachable carafe. Since the milk circuit is detachable, milk never actually enters the Accademia during the steaming/frothing process. You'll never have to worry about old milk contaminating your machine. As a matter of convenience, the milk carafe can be disconnected and stored in the fridge until you're ready to brew. For those who love to entertain, the Gaggia Accademia's intuitive interface offers a big advantage; it's so simple to use your guests can make their own beverages! On top of its impressive features, the Gaggia Accademia is a modern, attractive machine that would look great in any kitchen. It features a contemporary stainless steel front panel punctuated by a bright display and intuitive push-button controls. 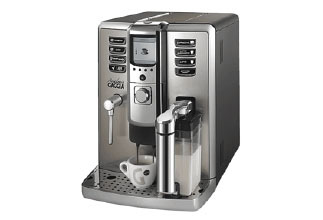 The Gaggia Accademia is the ideal companion for the busy coffee lover.